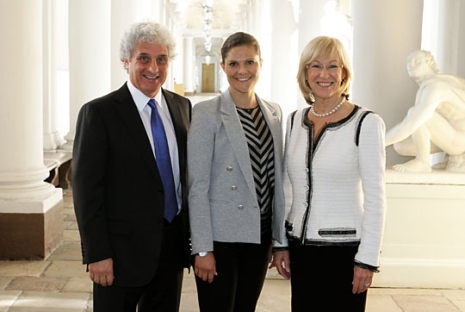 On Tuesday, September 23, the Swedish Crown Princess Victoria held an audience with Honorary doctor Patricia Kuhl and her husband Andrew Meltzoff at the Royal Palace of Stockholm. Professor Patricia Kuhl, Honorary doctor at Stockholm University, and her husband Andrew Meltzoff in a meeting with the Swedish Crown Princess at the Royal Palace of Stockholm (Swedish Royal Court). Patricia Kuhl is a prominent researcher in child language development, and has a long research-based collaboration with Stockholm Babylab at the Department of Linguistics. Professor Kuhl is head of the Institute for Learning and Brain Sciences and the NSF Science of Learning Center (LIFE), at University of Washington. Her husband, Professor Andrew Meltzoff, is an internationally recognized researcher of paediatric and developmental psychology, and is Co-Director of the UW Institute for Learning & Brain Sciences. Professor Kuhl held a highly appreciated open lecture, "Early learning and the child’s developing brain", at the Royal Swedish Academy of Sciences - Kungliga Vetenskapsakademien. As a new Honorary doctor of Stockholm University, Professor Patricia Kuhl will attend the inauguration ceremony on Friday, September 26, in the Blue Hall of the Stockholm City Hall, followed by a banquet in the Gold Hall and dancing in the Blue Hall.